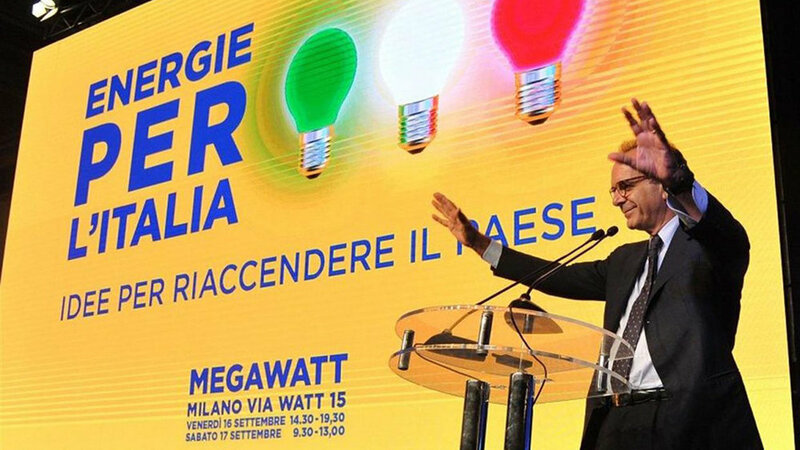 In September of last year I was invited to a convention called ‘Energie per l’Italia,’ organised by Stefano Parisi, a leading figure on the Italian political scene. The initiative was based around a subject close to my heart: generating new ideas to energise Italy, especially from a technology point of view. I’m very pleased to say that his team asked me to coordinate a working group dedicated to the digital transformation of Italy’s public administration, and the country itself. I love applying design thinking processes to social problems — but to be perfectly honest, I was excited and intimidated at the same time. The goal of the group was to build part of the political offering of a new movement, and delivering against such a project, with a brand new team at national level, was a huge challenge. However, it was very inspiring and I would love to share with you our initial thinking about the tasks facing Italy from a digital standpoint. Our team carefully reviewed all the material from the AGID (the Agency for the Italian Digital Transformation); particularly the website area that explains the Italian Digital Agenda and the concept of ‘Italy Login.’ We also deepened our engagement with the European Single Digital Market strategies, as the driver for Italian initiatives. The digital economy is able to expand markets, promote better services at better prices, offer more choice and create new sources of employment. It can create opportunities for new startups, and also allow existing businesses to grow and take advantage of the scale offered by a market of over 500 million people. Europe has the capacity to take the lead in the global digital economy, but currently cannot take full advantage of its position. The EU is hampered by fragmentation and barriers: the lowering of these barriers within Europe could boost European GDP by €415 billion (1). Overall, The Italian Digital Agenda is a set of actions and policies for the development of technology, innovation and the digital economy. It’s one of the seven flagship initiatives of the Europe 2020 Strategy, which sets targets for growth in the EU to be reached by 2020. Every Italian citizen will have an online civic profile from which they can access information and public services. A place of profiled, personalised interaction with the public administration, it will be enriched by filtered content relevant to an individual citizen’s opportunities and obligations. The project represents a genuine simplification of public administration, giving citizens a gateway to the state which is easy to use and accessible across all platforms. SPID is a system that allows citizens and businesses to access online services with a single digital identity. It is to be 'constituted as an open set of public and private entities’, managing registration and making available network access tools for citizens and companies on behalf of government. The Unique Digital Register is a database containing the personal data of the resident population, which can be referenced by municipalities, public administration and service managers. The Unique Digital Register will eventually take the place of more than 8,000 different registries run by Italian municipalities that are currently in existence. This allows citizens and businesses to make payments electronically to the government and to providers of public utilities. Public authorities will be able to reduce the running costs of collection, while users can choose a preferred payment channel and enjoy increased transparency (and potentially lower fees). Public authorities will benefit from immediate payment. This is public information that must be published in ways that make it easier to reuse. Fundamental aspects such as licensing, standardisation, quality, and accessibility through automated applications are central. Every political administration must supply open data, in line with international and national policies. Our team concluded that the concept of Italy Login is highly inspiring, essential, and fits well with the direction of a modern liberal ideology in which the state enables private exchange. We developed our vision for this concept further, by identifying the technological layers required for its implementation and the critical issues to be addressed. We have also developed the concept of the Italian API to be the single driving force for the development of services related to public administration. This is envisioned as a single platform into which developers can hook their applications, also being able to integrate new features into it. This concept reflects the modern software development methods adopted in the most innovative ecosystems on the planet. All enablers necessary to develop a digital service for the public sector will be accessible in a digital portal. Here is a quick picture of how Italy's API services can be made available. We also envisioned a system to control the level of services and solutions offered by the private to the public along the lines of an Italian App Store, where the individual departments and agencies can find all the applications needed for the digitisation of their services. Visually, this would look like the App Store we all use to download apps on mobile, tablet and computer platforms. We believe that this type of architecture will be critical to the success of the digital transformation of the country. We also propose the use of a peer-to-peer network to protect and manage citizens’ data. The state could deploy storage devices connected to the network structure of this type, giving citizens the vital security of being in control of their data and their privacy. The opportunity that presents itself today is for policies that are supported by functional architectures and ecosystems; digital platforms that will help citizens achieve greater efficiency, and reduce inequality. We have seen several times in studying the evolution of social systems that politics alone is ineffective at solving inequality. Now we need to make careful choices in the architecture of ecosystems, optimising not only for performance, but also for the democratic ecosystem progression, and ensure equal access to the opportunities of the network. Connectivity is radically changing the world, and the architecture of networks and platforms should help to reduce inequality in society. It will drive us towards access to a better life, but we cannot expect connectivity to solve the problem of inequality unless we understand it, and build in solutions as part of our technical architecture.